Neil Lennon will remain in charge of Bolton after the club concluded an internal investigation into allegations made by a newspaper about the manager. The club conducted the investigation after the Sunday Mirror alleged Lennon, 44, made a threat to somebody he was said to be romantically involved with. Bolton said they had "dealt with the matter and acted accordingly, details of which will remain private". 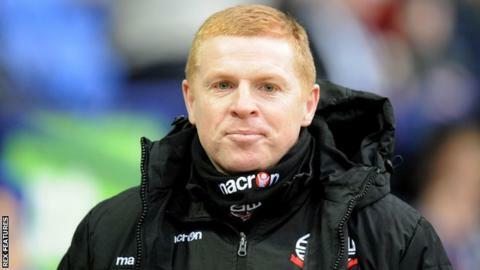 Lennon will lead the Championship's bottom club on Boxing Day at Rotherham. Bolton are £172.9m in debt and received a winding-up petition for about £600,000 in unpaid taxes. Takeover talks have been held with four parties but unless a deal is done, they face administration and a 12-point deduction. Bolton's players had not been paid in November, but Lennon confirmed they would get their wages by 29 December with help from the Professional Footballers' Association. Following the conclusion of their investigation, Bolton also said in a statement on Tuesday they "will be making no further comment on the matter". BBC Sport contacted Lennon for comment on Monday but a club spokesperson said the manager was unavailable.